Guinness World Records ™ has registered in Shanghai (China) the record in building the longest fruit line in the world. The certificate proving this world record has been awarded to the ASOEX Cherry Committee (Asociación de Exportadores de Frutas de Chile AG). This record required the use of 24,638 cherries that were placed side by side, in a continuous line, to finally form the figure of 2 large cherries. The celebration of the new Guinness World Record was held at the Shanghai Port International Cruise Terminal. The event brought together around 200 guests including representatives of the fruit industry in China, importers, wholesalers and fruit retailers. Chile is the main supplier of cherries in China, which is also the main customer of Chilean cherries, receiving over 85% of Chile's total cherry exports. 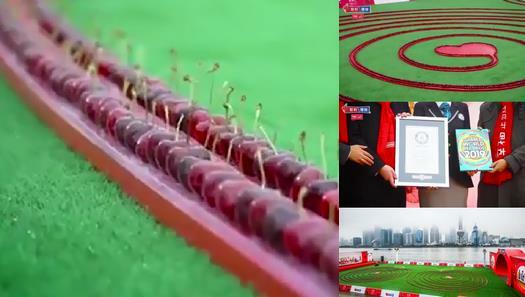 Organized in Shanghai, the world record for the longest fruit line was broken thanks to 24,638 cherries from Chile.